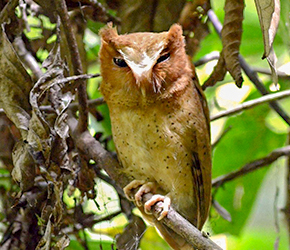 Currently there are 33 identified species of endemic birds in Sri Lanka, out of which most are found in the wet zone. The months of November through to April are considered the best months of the year to spot most of these endemics. The Kithulgala and Sinharaja forest reserves in the low lands are amongst the top spots to view a majority of these endemics. Horton Plains National Park in the hills is the best place to catch the endemics that enjoy their life at altitude. A rare ground – dwelling species it is present in the dense forests of the southern part of the island. 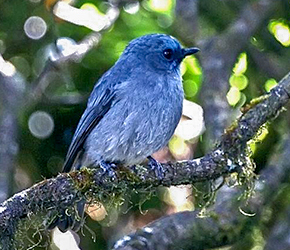 Essentially a forest bird that can be found infrequently in the hills up to about 2000 meters, but mostly in the Wet zone. Very timid and secretive; more often heard rather than seen. The characteristic strident ‘ringing crackle’ revealing its presence can be heard from a distance. Lives mostly in pairs. Kitulgala and Sinharaja are two of the best locations for the elusive bird. Another ground bird distributed in all climatic zones from the sea level up to the highest hills. 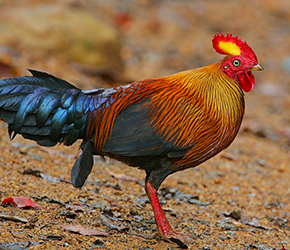 Though it is shy and vary, in areas, adjoining forests it can be very tame and behaves like a domestic fowl. Never ventures far from cover. 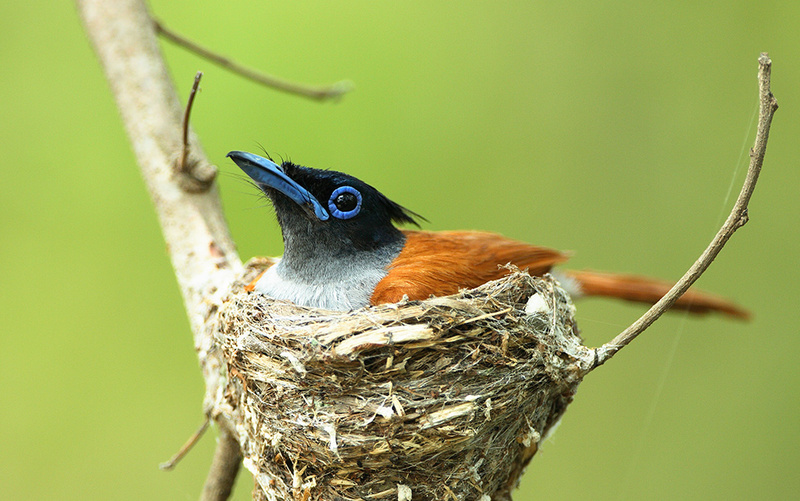 Though this bird is frequently seen in almost all forests, Sinharaja is the best place to see it in close quarters. This handsome large pigeon is confined to the wet zone. 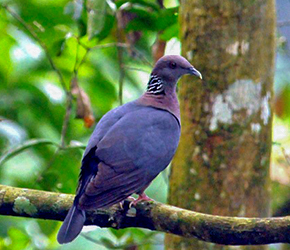 A scarce forest pigeon of hill forests and nearby well-wooded habitats, occasionally descending to the lower hills. Tends to spend much time in the canopy but never reluctant to come down to the ground to feed. Usually shy, lives in pairs or small groups. Horton Plains and Sinharaja are two very good places to see it. This handsome but smaller pigeon is by far the most familiar of the green pigeons, occurring almost throughout the entire low country and ascending the hills to about 1000 meters or sometimes even higher. It occurs in forest, well wooded cultivation and also home gardens. This is an arboreal pigeon, lives in small flocks and moves about a good deal. 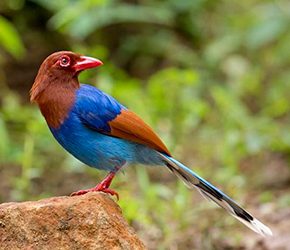 Kitulgala, Sinharaja and Udawalawe are some of the places where this bird can be seen easily. This diminutive and brilliantly colored parrot occurs everywhere in the hills up to about 1300 meters it also occurs in low country wet zone. 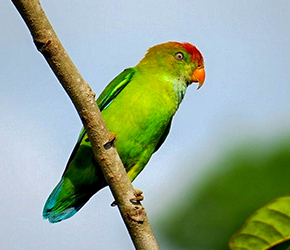 Like other Sri Lankan parakeets, this is a green bird with a short tail. 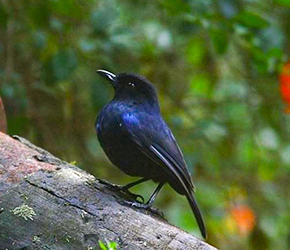 A fairly common small bird occurring in forested areas, home gardens and plantations. Usually lives singly or in pairs and sometimes in small parties. Kandy, Kitulgala and Sinharaja are the best areas to spot this bird. 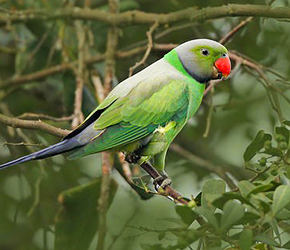 Layard’s Parakeet also inhabits the same areas as the preceding species. Smaller numbers occur in the drier parts of the hills (on the eastern slopes) and adjacent foothills. Usually lives in pairs and sometimes in small flocks. Kandy, Kitulgala and Sinharaja are its favorite haunts. Another forest dweller which has very arboreal habits. Not common by any means. Found mostly in undistributed wet zone forests and in a few of the tall riparian forests of the drier parts. An unmistakable large bird with a crimson red face. 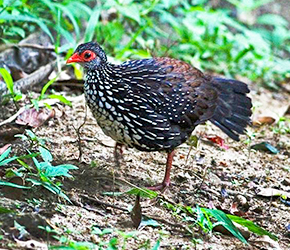 Very frequently, a member of mixed species flocks of Sinharaja rain forest. It usually lives in pairs but at times two or three pairs can be seen in these feeding flocks. Sinharaja is the easiest place to observe this bird. 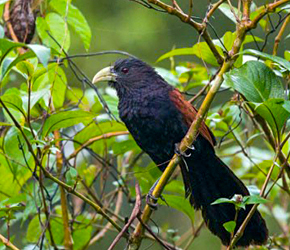 A slightly smaller coucal than the more common greater coucal from which it can be readily distinguished by its large pale green bill. 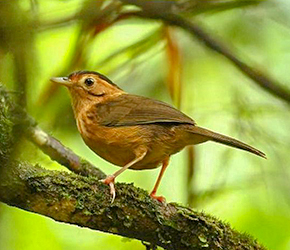 A rare forest loving bird that inhabits the dense undergrowth of wet zone forests with dwarf bamboo. Does not hesitate to come into home gardens adjacent to these forests, very elusive. Lives in pairs. Kitulgala and Sinharaja are again the best locations. 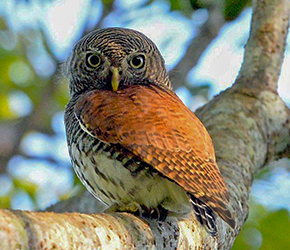 This small rufescent scops-owl with a short tail has a restricted distribution even within the wet zone where it is found. It has so far been located only in the rain forests of the south-west part of the island. It is entirely nocturnal and very rare. Kitulgala and Sinharaja are the prime sites for this species too. This is a handsome little owl with a chestnut back. A rather rare owlet of the wet zone forests that does not ascend higher hills. Lives in pairs and often can be heard and hence, located during day time. Does not hesitate to come into well wooded human habitations, sometimes even nesting in them. Kitulgala, Dombagaskanda and Sinharaja are some of the locations it could be seen. 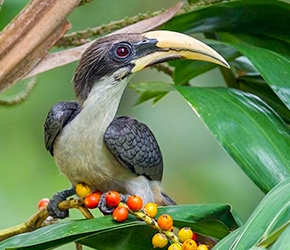 Of the two hornbills occurring in Sri Lanka, this is the smaller one. A locally common bird in all low country forests, well wooded areas and gardens. It occurs in both wet and dry zones and occasionally ascends the hills to about 1300 meters. It lives in pairs or small flocks. Like most hornbills. The female imprisons herself in a tree hole for incubation during the breeding season. 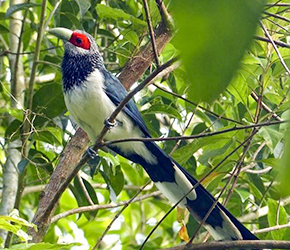 Kitulgala is among the best places for one to see this bird. 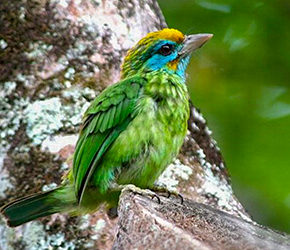 This beautiful barbet is one of the commonest endemic birds of Sri Lanka. Its incessant call is the trademark of the wet zone forest. Though more partial to heavy forests, that likes wooded home gardens. The call is audible over a fair distance. In Sinharaja, it can be seen as a regular member of the mixed feeding flocks. Udawattakele in Kandy is one of its best haunts. This is the only barbet that ventures into city gardens. 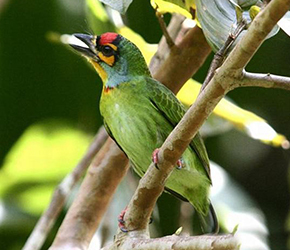 A small bird with bright green upper parts, unstreaked green belly flanks, bluish head with orange-yellow eye rings and throat patch, and very small scarlet breast spot. These features distinguish it from the copper smith in areas where both species occur. This is a common bird in cultivated or openly wooded country throughout the wet zone up to about 1000 meters and in scattered colonies in parts of the dry zone. 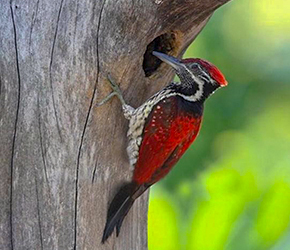 Almost the same size as the more widely spread black-rumped Flameback, this handsome woodpecker looks slightly bigger and can be distinguished from that species by its crimson back and wings, longer ivory color break and different call note. This is a forest loving species, distributed almost throughout the forested parts of the island but prefers the wet zone and mountains, where it which it ascends to the highest elevations. The female has a black crown with white spots. This rather slow flying swallow with reddish chestnut underparts and rump has a deeply forked tail. It looks heavier built than the other swallows in the island. It is found throughout the lowlands and the hills to about 1300 meters. It prefers open country and can be seen in pairs or small scattered flocks. 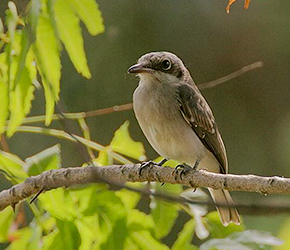 A small grey bird with a dark eye stripe like that of the true shrikes. The female of this inconspicuous bird is duller and browner than the male. Can be seen all over the low country hills up to about 1000 meters but is commoner in the dry zone. Does not like dense forests. It is arboreal and lives in pairs. This is a fairly common bulbul with olive green upperparts, brown tail with broad white tips to outer tail feathers, yellow throat and underparts with olive tinge on breast and flanks. It has brown flight feathers and a yellow underwing. Male has red iris while that of the female is brown. Occurs in pairs or small parties in open forests and woodlands of lowlands and hills, up to at least 1300 meters. 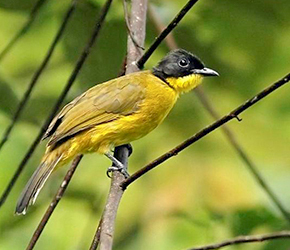 This bulbul is a montane species occurring above 1300 meters in the up country. In the higher hills, however, it is one of the commonest birds. It frequents jungles, wooded ravines and well wooded gardens. Usually found in pairs, though small parties are not uncommon. 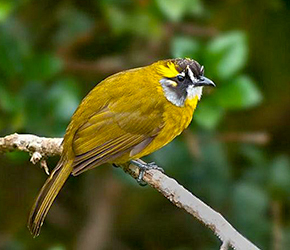 This unmistakable bulbul has distinctive head markings with long yellow ear tufts. Hence the name yellow eared bulbul. Nuwara Eliya and Horton Plains are the best locations to see it. 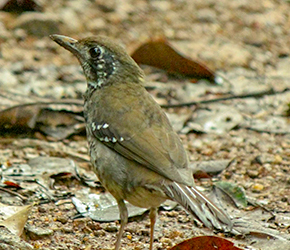 This crepuscular thrush with and overall black appearance (black beak and legs) is a very rare and shy bird and found only in elevations above 1200 meters. This is also called Arrenga, and the Arrenga Pool in Horton plains is one of the few places where it can be observed. In good light and close quarters, one can see the bright blue patch on the shoulder. It prefers habitats adjacent to streams and ponds. 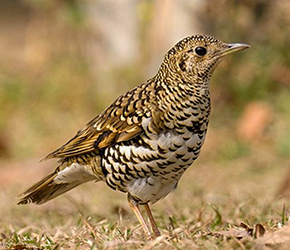 A very striking thrush with rich olive brown upper parts, two rows of spots on median coverts and a characteristic black and white facial pattern. It is found throughout the low country wet zone and the hills up to about 2000 meters, a bird of forest and well wooded gardens adjacent to these areas. 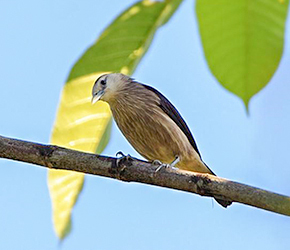 Its melodious song can be heard at dawn and dusk in Sinharaja, Dombagaskanda and Kitulgala where it could be easily observed along the trails. This is a rare shy forest dwelling ground thrush, olive brown above and with rufous buff under parts. The scaly pattern of the body, the large and long bill and chunky appearance make identification easy. Found between the lower hills and up to 1700 meters. Spends most of its time on the ground, turning over dead leaves and looking for insect food. Sexes alike. The skulking bird is found only above 1500 meters in dense undergrowth moving stealthily but occasionally showing itself well. Generally dark with rusty-buff throat, dark grey breast, and rounded tail. Faint pale eyebrow and pale eye ring. Olive brown upper parts with a rusty tinge on rump, olive grey belly with rufous tinge on flanks and under tail. Male has red eyes and female pale buff. Nuwara Eliya and Horton plains are the best locations to see this rare bird. This is another hill country endemic of dull blue great coloration. A conspicuous brighter blue forehead makes it easily identifiable. 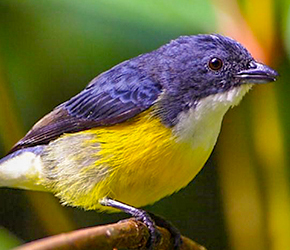 This flycatcher is confined to the hills above 650 meters but is not common bellow 1000 meters. An inhabitant of forests and well wooded estates and gardens where plenty of shady trees provide the seclusion it likes; in such places it is a familiar bird and not shy at all. 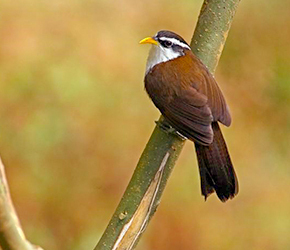 This babbler is of sober colors; brown upper parts with darker brown cap and nape; face, supercilium and under parts are cinnamon or pale rusty. A forest loving bird that lives in pairs and is found throughout the island. It ascends the hills to at least 1600 meters. Both sexes alike spend much time on the ground turning over leaves looking for insects. Heard more often that seen. 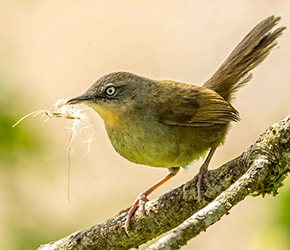 This very vocal and attractive slender babbler has a long yellow down curved bill, long white eyebrow extending onto the nape and a black eye stripe. Upper parts are rusty brown with a dark brown crown, white under parts with brown flanks, vent and under tail coverts. Both sexes alike. However, it is not confined to forests if sufficient cover is available, it will take up residence in estates and well wooded gardens. Lives in pairs or family parties. 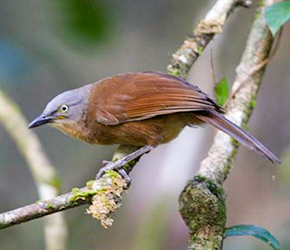 The rufous babbler is distinguishable from other babblers by its rufous coloration and bright orange bill and legs. It can be seen in most of the undisturbed forests in the wet zone and in the hills to highest elevations. Though it is a forest bird it often ventures into will wooded gardens in adjacent areas. Always in small groups busily working their way through the foliage of trees and understory. Another nucleus species of the feeding waves of the Sinharaja forest. A noisy bird that reveals its presence by continuous chattering and squeaking. 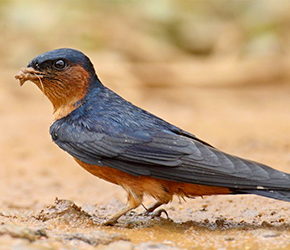 This is another bird that lives in flocks and is also associated with the feeding flocks of Sinharaja. Looks much neater than the rufous babbler. It is confined to the deep forests of the wet zone and adjacent hills. It ascends to at least 1600 meters. It is a noisy bird, constantly chattering and squeaking. 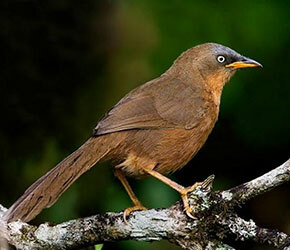 These calls can easily be mistaken for those of the rufous babbler. A very attractive bird when looked at closely. Can be easily differentiated from the rather similar purple rumped sunbird by its short, stout bill. Males have dark blue grey upper parts with white tips outer tail feathers (less apparent in the female), white throat and upper breast. Rest of the under parts are yellow, paling it white on under tail coverts. Females are generally paler with grey olive upperparts. This scarce bird is confined to the rain forests of the south western part of the wet zone and the adjacent hills up to about 1000 meters. Lives either solitarily, in pairs or in small family parties. Another hill country endemic recorded only about 1000 meters altitude where it could be the commonest bird. Forms scattered flocks except in the breeding season, when it pairs up. 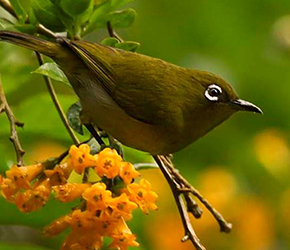 Slightly larger than the similar oriental white eye and also is of a darker jungle green plumage. The white eye ring is more widely broken in front than in oriental white eye. Lower breast, belly and flanks are grayish white. Nuwara Eliya and Horton plains are two of the best sites for this species. 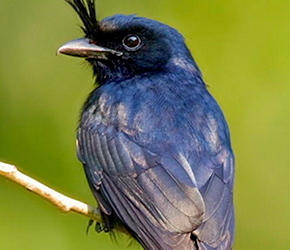 Earlier regarded as a race of the greater Racker-tailed Drongo, which is found in the dry zone. The frontal crest, glossy black plumage and long, deeply forked tail without the rackets make it easy to identify. A very vocal mimic that imitates a variety of birds. It inhabits the tall forests of the wet zone ascending to at least to 1600 meters. It is one of the nucleus species of the feeding waves in the Sinharaja forest. 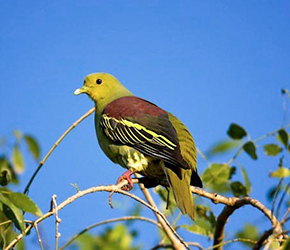 Indubitably one of the most colorful endemics of Sri Lanka. This large, beautiful bird cannot be mistaken for any other Sri Lankan species. Mainly bright blue with red bill, and eye ring and legs; chest nut head and neck; long graduated blue tail with black and then white tip. It inhabits the forests of the hills and the wet zone foot hills. A scarce bird, generally seen in small family parties of up to six or seven; but pairs and solitary individuals are sometimes observed. A scarce slenderly built starling with white forehead, face, throat, and under tail coverts. The white of the head merges streakily into the greenish grey black of the back, wings and tail while the white throat shades into the smokey grey of the breast and underparts which are streaked with white. It is confined to the tall forests of the wet zone and adjacent areas, ascending to about 1500 meters. Strictly arboreal, frequenting tops of tall trees. Lives in pairs or small flocks. Aldo seen in the Sinharaja feeding flocks. A sleek black bird with a pair of yellow wattles on the nape and a white wing patch. Very pale grey eye and black based orange –red bill. This can be easily distinguished from the southern hill myna (the only other Sri Lankan bird with which this can be confused) by the presence of only a single pair of wattles. 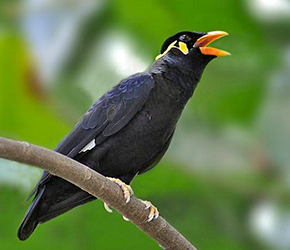 This myna inhabits the forests and well wooded country of the wet zone, ascending the hills to at least 2000 meters. Lives in pairs or small parties.